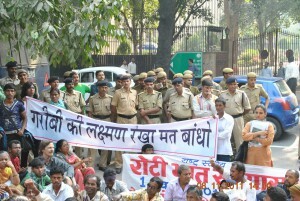 Right to Food welcomes Jharkhand govt step to withdraw DBT for food subsidy "following protests"
The Right to Food Campaign, Jharkhand has welcomed the state government’s decision to discontinue the “DBT (direct bank transfer) for food subsidy” experiment in Nagri. It is unfortunate, however, that it took almost a year of popular protests for the government to arrive at this decision, it said. The DBT pilot caused enormous hardship to the people of Nagri, especially vulnerable groups such as single women and the elderly. Protests began within days of the experiment being launched in early October 2017. In February 2018, a field survey found that 97% of respondents in Nagri were opposed to DBT. Thousands of people walked from Nagri to the Governor’s House in Ranchi on February 26 to demand the reinstatement of the old public distribution system (PDS). In April, the state government’s own social audit confirmed the results of the February survey. All but two Gram Sabhas in Nagri also passed resolutions against DBT. It is a mystery why it took another four months, after that, for the state government to decide to discontinue the experiment. Meanwhile, the Right to Food Campaign has appealed to the state government to abstain from any further experiments of this sort. Instead, the public distribution system (PDS) should be further improved and consolidated, e.g. by universalising the PDS in rural areas and including pulses and oil in the PDS basket.